Previous post: To Be, Or Not To Be A Mortician? To celebrate the paperback release of Rest in Pieces: The Curious Fates of Famous Corpses, author Bess Lovejoy is giving away a signed copy of her book. 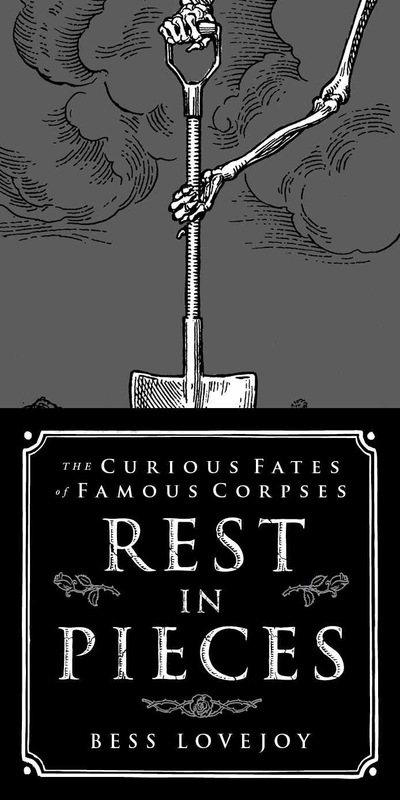 Rest in Pieces catalogs stories from the age of antiquity to today, tracing the evolution of cultural attitudes toward death and connecting the lives of the famous deceased to the hilarious and horrifying adventures of their corpses. For Death & the Maiden, Bess shares the story of Eva Perón. As eventful as the First Lady of Argentina’s life, Evita would go on to make further public appearances, travel and continue to cause a political stir before her body was finally laid to rest. Bess is the author of Rest in Pieces: The Curious Fates of Famous Corpses, which has been praised by Mary Roach, Simon Winchester, the Amazon Best Books of the year list, and the Times Literary Supplement, which said the book contained “something to dismay everyone.” She is a former editor for Schott’s Almanac and Smithsonian.com and currently an editor for mental_floss. Bess is also a member of the Order of the Good Death and a founding member of Death Salon. She lives in Brooklyn with a cat and a boyfriend. Eva Perón played many roles during her short life: child of poverty, radio actress, First Lady of Argentina, charity maven, and finally, martyr. She was accused of being many other things as well: a prostitute, Fascist sympathizer, co-dictator, and harborer of Nazis. These days, she is most often remembered as the Evita of musicals and movies. But she played her longest, strangest role as a corpse. Evita was embalmed for eternity in the same way that Lenin was, subjected to months of chemical baths and injections that turned her from an ex-person into a statue, or something in between. She was so tiny she looked like a doll—not even five feet tall, after the cancer and the chemicals. But despite her innocent appearance, her corpse was at the center of two decades of mayhem and madness. While she was alive, Evita’s image had always been about love. As First Lady, she described herself as the “bridge of love” between her husband, Juan Perón, and the mass of Argentine poor, the descamisados (“shirtless ones”) who had swept him to power. While her husband recoiled from human contact, Evita spent her days receiving long lines of the needy, embracing even the lice-ridden and syphilitic, and granting their requests for money or medicine. Through her eponymous foundation, she dispensed millions of gifts and built hospitals, orphanages, and schools. They called her “Lady Bountiful.” She never rested, even when the doctors told her to. And when she died of uterine cancer at age thirty-three, her followers said she had sacrificed her life to the cause. Within days, the Vatican was flooded with letters begging for her canonization. The Church wasn’t interested, but that didn’t prevent Argentina’s poor from worshipping her at altars across the land. Meanwhile, Juan Perón—conscious of the fact that he had lost both the beautiful face and beating heart of his movement—decided to have his wife preserved forever. Even before Evita died, Perón began holding secret meetings with an anatomy professor named Pedro Ara, a Spaniard famous in Buenos Aires for his work embalming the composer Manuel de Falla. Dr. Ara preferred to think of himself as an artist rather than an embalmer (he called himself a practitioner of the “art of death”), and even carried the preserved head of an elderly peasant in his luggage to show off his skills. Like Lenin, Evita was embalmed in two stages: once for a brief public viewing, and once for eternity. Ara got started on the first stage within an hour of Evita’s death, and by the following morning, her body had been made “completely and definitively incorruptible,” as he put it. Dressed in a white shroud and draped with the national flag, her body was placed in a glass-topped coffin and carried to the Ministry of Labor, which had long been her headquarters. There nearly two million people came to see her, bringing so many bouquets and wreaths that the flower shops of Buenos Aires were cleaned out. The three-day viewing period was extended to two weeks, but then Dr. Ara got nervous: if the president wanted Evita to last forever, Ara had to get to work. Evita’s body was supposed to become part of a massive funeral monument, something like Napoleon’s tomb at Les Invalides. The first lady herself had been planning the monument before she died, though originally it was meant to pay tribute to the idealized Argentine worker, not to her. But in September 1955, three years after her death, Juan Perón was deposed in a military coup. The construction of the monument had not gone beyond a massive hole in the ground. Perón fled into exile on a Paraguayan gunboat. At first, the new regime left Ara alone in his offices at the General Confederation of Labor. The professor had set up his embalming lab there, and spent most of his time watching over his masterpiece, repairing real or imagined defects. But a few months later, curious officers started coming to see the body. In the beginning, they refused to believe it was real, even when Ara handed over X-rays. Finally the officers amputated part of a finger, and only then were they convinced they were dealing with an object that had once been a human. And not just any former human. The new rulers were so adamantly anti-Perónist that they’d banned images of the former first couple from the country, and scratched Evita’s name off hospital beds and sheets before using them. Confronted with her corpse, the last thing they wanted was a burial site that followers would turn into a shrine. However, they also didn’t want to harm the body; the new president, Pedro Aramburu, was a devout Catholic, and the Church had turned down a request for cremation even in this unique case. Burial was bad for Aramburu’s political future, but the other options were bad for the future of his soul. So the president and his men decided on a secret burial. The location they chose was the Chacarita Cemetery, the largest in Buenos Aires, and the man they entrusted with the job was Carlos Eugenio Moori Koenig, the head of military intelligence. One night in November 1955, Koenig appeared at the Confederation building to take the body away. Though he must have been concerned about the fate of his masterpiece, Ara had little choice but to help Koenig load the body into his truck. Afterward, Koenig was supposed to bring the body to the Chacarita Cemetery, but instead he went crazy—or at least that was the judgment of his superiors. It started when he parked the truck carrying Evita’s body in the courtyard of a Marine regiment for the night, then awoke to find the vehicle surrounded with candles and flowers. He then loaded the body into a different, unmarked, truck and drove it around the city, stopping in a different place each evening. But every morning brought the same thing: candles and flowers. Clearly someone always knew where the corpse was, no matter how hard he tried to keep it a secret. Spooked, Koenig hid the body in a box in the attic above his office at military intelligence headquarters. About a year later, he showed it to a friend, who let word get back to Aramburu. The president decided that Koening was suffering from a nervous breakdown, and dismissed him both from his duties as Evita’s caretaker and from his job. In 1957, the regime decided to try giving Evita another secret burial. This time, they planned to take the body out of the country, and therefore “outside politics”—or so they hoped. Under “Operation Cadaver,” the body was sent to Italy, where it was buried under the name of an Italian who had died in Argentina, Maria Maggi de Magistris. The operation was so sensitive that even President Aramburu didn’t know the details. He entrusted a letter with the corpse’s location to his lawyer, with the proviso that it should be delivered to his successor four weeks after Aramburu’s death, whenever that might be. Aramburu’s body was soon discovered by the police. But the current Argentine government had already decided to make peace with Perón, who retained a powerful hold on his followers even in exile. Since Aramburu was now dead, his lawyer delivered the envelope with Evita’s burial details to the current leader, General Alejandro Agustín Lanusse. Lanusse shared the contents of the letter with a colonel and a priest, whom he dispatched to find Evita’s body. The letter contained nothing more than the names of a cemetery in Milan and a priest who had since passed away. There was nothing for the colonel and the Argentinian priest to do but comb through the cemetery’s records for 1956, the year of Evita’s clandestine reburial. After some work, they zeroed in on Maria Maggi de Magistris, an Italian widow who had died in Argentina but was buried in Milan five years after her death. The enterprising colonel grew a mustache and, with the help of fake papers, posed as the brother of the deceased in order to get permission to exhume the coffin. Sure enough, the body inside was Evita’s. The corpse arrived at Perón’s villa in Madrid in a bakery truck. Dr. Ara, summoned from retirement, restored his work to its former glory, while Perón’s new wife, a former cabaret dancer named Isabel, restyled the hair in Evita’s signature chignon. According to dinner guests, the refurbished Evita then went on display in the Perón family dining room. Perón was elected for his third and final term in 1973, and everyone assumed he would return from Spain with Evita’s body in tow. He didn’t, and died after only a year in office. In 1974, his wife and successor, Isabel, finally brought Evita home, but only after guerillas kidnapped Aramburu’s corpse and again demanded Evita’s in return. This time their plan worked, and Isabel had the body flown from Spain to Buenos Aires by chartered plane. Isabel exhibited Evita’s corpse in Buenos Aires next to her husband’s closed coffin, and planned to build them both a giant monument. But like Juan’s efforts, her plans were cut short by yet another military coup. She was deposed in March 1976, and later that same year the new regime finally returned Evita’s remains to her family. Soon afterward Evita was buried in the fashionable Buenos Aires cemetery of Recoleta, near many members of the oligarchy she despised. Her embalmed corpse now rests twenty feet below ground in a steel vault said to be able to withstand a nuclear bomb. To enter the giveaway, share your favorite death-related quote on Twitter, Instagram, or Facebook, tag it #RIPbook (so we can find it later), and contemplate your mortality until February 14, when the winner will be chosen.